Every coastal country has a long navigation tradition. They developed a broad maritime vocabulary that sounds like bafflegab to ordinary people (the landlubbers). And when You campare these terms, it becomes even more funny! The mast cap has a funny name in other languages: the "donkey head". It describes the visual form of the part that conjuncts two mast parts of an ancient sailing ship. The "donkey head" in those languages derives from the Dutch "eselhoofd", which was translated literally or transformed vocally in many other languages. Even as the form of that part changed through times, its name did not. And another example of strange words: the dead eye is already a weird expression, but guess what ... many other nations call this a "virgin" ?! Languages are funny! 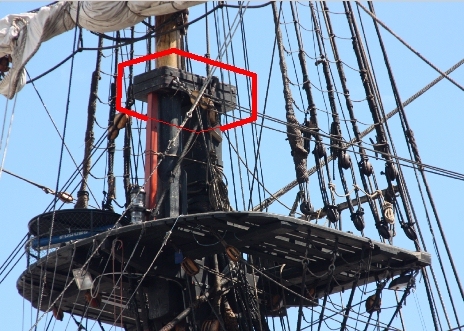 Two completely different parts of the rigging may have the same or a similar name in different languages, or the name has wandered from one thing to another: the French "mat de mizaine" does NOT match the English "mizzen mast", but the "foremast"!!! 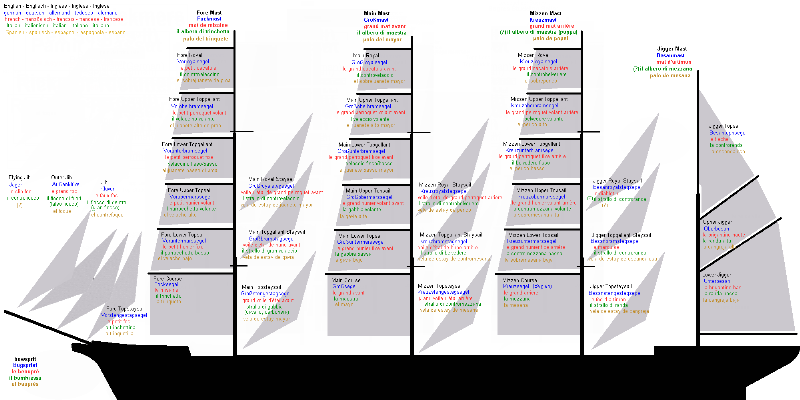 So, guessing from one language into another does not always work ... compare the sail names in English, German, French, Italian and Spanish - it will make You wonder! You will notice that the "Mediterranian" naming of the sails is completely different from the "Northern European". And, even the Spanyards and the Italians may "mix up" things named similar... but in their own languages, it makes sense to them. The famous British "Royal Sovereign", a mixture of an giant battleship and golden king´s palace that ruled the North Sea between 1637 and 1690, was nicknamed the "Golden Devil" by the Dutchmen. And many British Navy ships´ names traditionally began with "Royal". Since the United Kingdom established its rule of the world, English became the lingua franca of seamanship. But many seamen proudly kept their languages, but took over many words. The English "captain" is "Käpt´n" in German and "Kapten" in Swedish - with almost the same pronounciation. The same way, the Mediterranian languages share "capitan". The Japanese "Kan-Chou"(艦長) sounds like it only by coincidence, because the two syllables are Japanese readings of Chinese characters, that Japan "imported" since about 1000 A.D.: "Kan"(艦) means ship and "Chou"(長) means chief or leader. But, You still find most of Japanese rigging terms derived from English, but "chopped" into Katakana syllable characters, like "seru", from English "sail", often pronounced as "s´l". 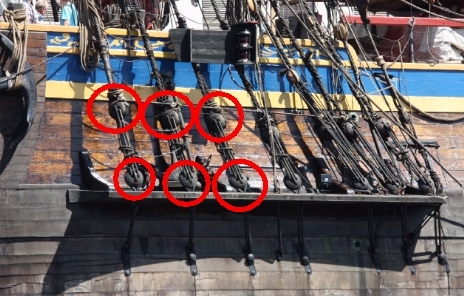 This is because the rigging type was "imported" when the British Empire was at its peak and all seamen spoke English. With the migrations of seamen and ships carpenters, the languages mixed with each other, and many words were integrated just vocally and sometimes "cut" in strange patterns. Thus You find many Dutch words in North European languages, and also in Polish and Russian! These languages had no linguistic relations, and the origin of some words are hard to recognize. If You recognize them, it can be fun! Dutch sounds very closed to a North German dialect (Plattdeutsch) in German eyes and ears. Swedish (where I live now) is very much related to the other Scandinavian languages Danish and Norwegian (but not at all to Finnish!). I had had some years of Latin and French at school, that helps me in the romanic languages French, Spanish, Italian and Portuguese. Romanian is another romanic language in Eastern Europe. Russian, Polish and other Eastern European languages share most of the grammar and many words. Chinese looks similar to Japanese because Japanese use Chinese characters - but it only looks like that, it is pronounced completly different, and has another grammar. And Corean are just between these two languages, although they all cannot understand each other. But Greek and Turkish are a book of 6½ seals to me, I only know some basic about it, so I would appreciate any comments. If You feel that some error should be corrected, please drop me a line to j_gelbrich@gmx.net!